From Left to Right: Dr. Colin Durkop, president of the Carnival Association, Ambassador Seidt, Chef Park, and Dr. Guenter Reinke, CEO of Boehringer Ingelheim East Asia. 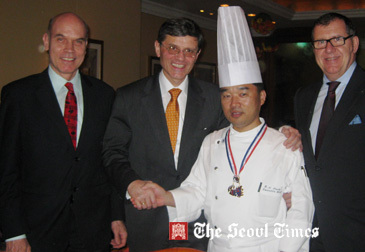 Executive Chef Park Hyo-Nam of Millenium Hilton Seoul , made a honorary member of the 1st Seoul Carnival Association and received the Gold Medal of the Association from the German Ambassador Hans-Ulrich Seidt on March 18, 2011 in the Seoul Millenium Hilton. A highly recognized master of his craft, Park has been introduced to the world's mainstream media, as well as local ones. Park has garnered a number of prestigious awards which include the World Culinary Contest in Singapore in 1996. He was also awarded the Medaille du Merite Agricole in 2006, a prestigious decoration bestowed by the French government. Park was also appointed by Lufthansa to create tailor-made premium menus for passengers onboard flights from Korea to Germany since March 2009. He is the first Korean to be appointed not only as a Lufthansa Star Chef, but also as Executive Chef within the Hilton's multi-national hotel chain. Park has been working at the Millennium Seoul Hilton since 1983. He has also been praised by the local media for his hard work and dedication to his duty. Armed with his strong touch of culinary genius, he took charge of the highly-acclaimed French restaurant Seasons. Park is also in charge of the five-star hotel's eight dining outlets and additional banquet services.